Every contribution enables us to remain an independent, community hospital offering the highest quality of care, to every patient, every time. Outstanding physicians and superior nursing care combine with the highest degree of technology to make GBMC the first choice of more than 100,000 individuals each year - performing more than 40,000 surgical procedures, delivering more than 4,500 babies and treating more cancer patients than any other community hospital in Maryland. Want to learn why it is important to give? Watch this short video to hear from our President and CEO, Dr. John Chessare, as well as several GBMC patients. Thank you for your support! 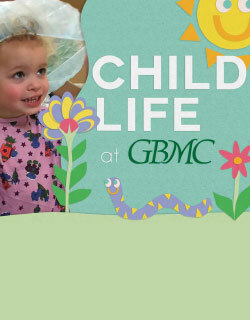 GBMC is an independent community hospital. Your corporate dollars stay within your community. Studies show consumers prefer companies that support local causes. Responsible corporate citizenship is healthy for business. Positions your company as a supporter of community efforts and one that cares about its community and the people who are a part of it. For more information and to learn how your company can partner with GBMC, please contact our Director of Corporate Development, Beth Garner at 443-849-4328 or egarner@gbmc.org. About 73% of the GBMC Foundation's income comes from foundations each year. We rely on their generosity to sustain programs and resources we do not receive reimbursement for but every bit as essential to the community as traditional hospital services. If you are a foundation interested in making a donation or learning more about our needs and if they are a match with your priorities, please contact our Director of Philanthropic Engagement, Kate Thorne, at 443-849-2794 or kthorne@gbmc.org. A planned gift is a way to ensure your wishes are met even if you aren't here to advocate for them. It ensures your legacy continues long after you are gone, helping others you will never meet but will greatly benefit from your generosity. It is one of the most selfless gifts an individual can make and GBMC has a wonderful team to guide you through your intentions. To learn more about making a more impactful gift that will keep GBMC on the cutting edge of technology and grow our incredible medical staff for the future, contact Senior Director of Principal Gifts, John C. Jeppi, at 443-849-3303 or jjeppi@gbmc.org. Learn about how your generosity made a difference at GBMC during 2018. Help us shatter the stigmas of sexual violence and domestic abuse! To encourage a dialogue and show support for survivors, GBMC will host its second annual Walk a Mile in Her Shoes®. Proceeds from this one-mile fun walk will support the Sexual Assault Forensic Examination (SAFE) and Domestic Violence programs at GBMC. All men and women (whether wearing heels or not!) are encouraged to participate in the walk and pre-party with food and prizes. Register and raise $200 to earn your choice of red high heels or red Converse sneakers. What if you could play golf and help thousands of patients at the same time? All golfers will play in the afternoon flight on one of two 18-hole courses at the beautiful and scenic Turf Valley Resort in Ellicott City, MD. Lunch, dinner and a spending certificate to our pop-up pro shop is included for all golfers. 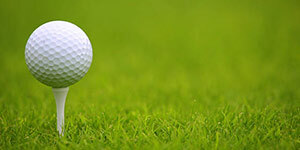 Proceeds of the Golf Classic will provide education programs to GBMC HealthCare's clinical staff. 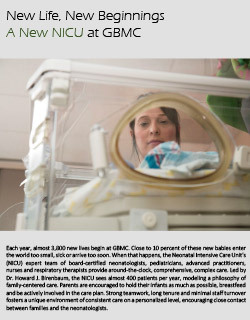 Help us support the Neonatal Intensive Care Unit (NICU) at GBMC! 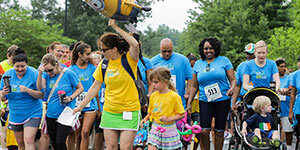 Father's Day 5K takes place on GBMC’s beautiful Towson campus and the entire family is encouraged to participate. Don't forget to come early and stay late for a great wellness village with food and prizes! Set in Maryland’s picturesque horse country, Legacy Chase is GBMC’s signature event benefiting its oncology services and patient support programs. Fill up your car with family and friends, pack a cooler and picnic and spend a day in the warm September sun for this homecoming of the GBMC community. The Baltimore Running Festival brings over 15,000 members of the community together, and draws people from almost every state, as well as other countries. Team RUN GBMC offers the chance to bring attention to a much-needed service for Baltimore City residents. Our team of grateful patients, employees and community members work to fundraise for Gilchrist Center Baltimore, which is positioned right on the course. 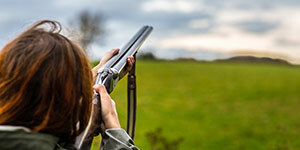 Support through this event brings exposure for your company that goes beyond your community. 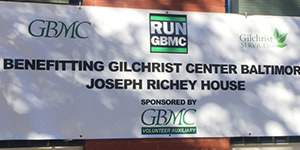 Gilchrist Center Baltimore is the only hospice facility in Baltimore City. It has 19 in-patient beds and serves 150 patients each year. Founded in 1997, and still 30 years later, Gilchrist Center Baltimore is committed to providing exceptional hospice services to everyone, regardless of their ability to pay. Annually, they incur $1.2 million in uncompensated care costs. Interested? Contact Morgan Cook at 443.849.2120 or mcook@gbmc.org. 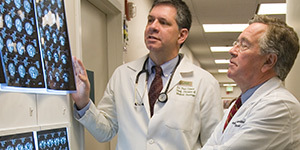 In April 2018, Jeffrey Sternlicht, M.D. presented one of the most popular lectures in the history of the Deane C. Laycock Perspectives in Medicine Lectureship. One year later, Dr. Sternlicht has agreed to return to host a panel to discuss cutting edge ways GBMC is fighting the opioid crisis. Come meet key leaders in GBMC’s Enhanced Recovery After Surgery (ERAS) program who will explain how they are drastically cutting opioid usage for patients and reducing the risk of opioid addiction. 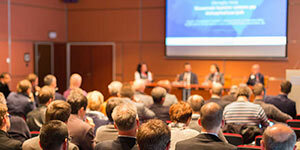 Joining Dr. Sternlicht will be Lee Schmidt, MD, Frank Rotolo, MD and Kara Douglas, CRNA. Please come to the spring edition of the Laycock Lectureship and join in this provocative discussion. For more details or to register, please contact the Philanthropy Department at (443) 849-2773. More than 7,000 people made their way to Shawan Downs on Saturday for GBMC's 17th annual Legacy Chase. 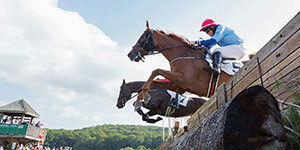 The tradition of steeplechase racing and family-friendly fun was all about raising money for families affected by cancer. Dr. Robert Donegan, chief of medical oncology, says that cancer survivors treated at the center are celebrated at the event which includes tailgating and live music. According to Robert Donegan, an oncologist in the Berman Cancer Institute at the Greater Baltimore Medical Center, the theme for the Legacy Chase at Shawan Downs in Cockeysville on Saturday — “Hats, Horses and Hope” — fits perfectly with the 17th annual event’s goal of raising funds for cancer research while celebrating those who are fighting or have survived the disease. When 6-month-old twins Mason and Karter Barget were born, their arms were smaller than an adult finger. Indeed, each of their arms could fit inside the wedding band of their father, Kyle Barget, of Timonium. Investment in a healthcare system that is able to offer high-quality care while reducing cost is something we are proud to provide patients and the community. But it only comes through the generosity of the people in these giving societies and their commitment to our mission and vision. Every dollar donated to our organization ensures our patients have access to the right technologies, people and resources they need to stay well or to heal. The 1965 Society recognizes the extraordinary commitment and foresight of philanthropists who have created an enduring legacy for the future. The 1965 Society is named to commemorate, forevermore, the year that our founders established GBMC. Recognizing those whose philanthropy to GBMC HealthCare and Gilchrist Hospice Care places them at the vanguard of supporters. The Society's namesake, Jospeh Keelty, is a distinguished Baltimore businessman and philanthropist, who has provided outstanding leadership and exceptionally generous support to GBMC. The GBMC Platinum Society is comprised of donors who have given between $100,000 and $250,000, cumulatively. Many of these donors have created endowed gifts that will continue in perpetuity in support of specific programs or departments at GBMC. Other donors at this giving level have given unrestricted gifts that GBMC can put to use immediately toward the area of greatest need, at the time of the gift. Often times, Platinum Society donors have made the decision to give over many, many years consistently and through complex gifting arrangements which can involve gifts of real estate and legacy gifts. GBMC is truly fortunate to receive this substantial support from these loyal philanthropists who have positioned our healthcare system for success both now and in the future. The 50th Anniversary Society includes GBMC benefactors who have generously given between $50,000 and $100,000, over their lifetime. This Society is named in honor of GBMC HealthCare's 50th Anniversary. Donors who have given at this have made GBMC a priority in their philanthropic planning. For that, the healthcare system is very grateful. GBMC's first 50 years are marked with many milestones. It is through the generosity of our steadfast donors that GBMC is able to maintain its standing as the community's last independent healthcare system. 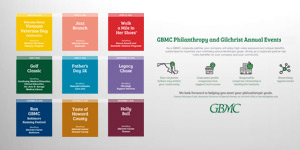 These gifts will help ensure GBMC remains strong over our next 50 years and beyond. The GBMC Silver Society is named for GBMC's 25th anniversary. Much of the tradition of giving and GBMC's service excellence was firmly established in the first 25 years. Those same traditions have maintained GBMC's strength and standing in the Greater Baltimore community over the institution's lifetime. Silver Society members have made cumulative gifts to GBMC of up to $25,000. These gifts are the backbone of our fund raising efforts. From our earliest days, without the support of the community at large, GBMC would not exist. We treasure our Silver Society and are grateful that they have contributed loyally over the years. Mrs. Yaggy made the first gift to start a capital fund to purchase land and create a new suburban hospital. Her efforts, and the efforts of those who followed her, created the hospital we now know as Greater Baltimore Medical Center. 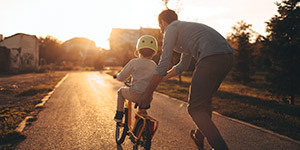 The Elizabeth Duncan Yaggy Society recognizes individuals who provide for GBMC in their wills, through insurance, through testamentary trusts, or through other gift planning arrangements. 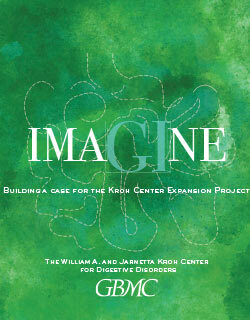 Members of the Yaggy Society receive special mailings and invitations to events at GBMC. The William A. & Jarnetta Kroh Society was formed in 2004 to recognize the extraordinary support of Bill and Jarnetta Kroh as well as donors of $10,000 or more annually. Donors at this level of giving are also members of the Virginia Sherwood Council and receive the benefits of the VSC: an annual pass for complimentary parking when visiting GBMC, prominent listing in the GBMC Foundation's Annual Report and on the Annual Giving Plaque, and are invited to the Annual Recognition Dinner held each Fall. Donors at this level of giving receive a prominent listing in GBMC Foundation's Annual Report and Annual Giving Plaque, early access to the Nearly New Sale, an invitation to the Annual Donor Recognition dinner, complimentary parking when visiting GBMC, ten percent off at the GBMC gift shop and cafeteria and two event tickets to Legacy Chase. Created in 2012, the President's Club recognizes the generosity of hospital contributors who donate $5,000-$9,999 annually. Benefits of membership includes the contributor's name in the GBMC Foundation Annual Report, early access to the Nearly New Sale, the contributor's name on a plaque, an invitation to the Annual Donor Recognition dinner, GBMC complimentary Parking Card, 10 percent off at the GBMC Gift Shop and Cafeteria and two event tickets to Legacy Chase. Virginia Barrett Sherwood dedicated years of service to the Greater Baltimore Medical Center. 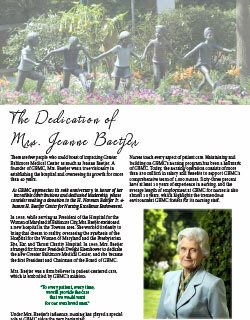 In 1991, a council was established to recognize the extraordinary generosity of GBMC's major benefactors. In tribute to the impressive dedication of Mrs. Sherwood, it was named in her honor. The Virginia Sherwood Council welcomes individuals, businesses, and foundations who contribute $2,500 or more in a calendar year. Benefits of membership includes the Annual Recognition Dinner held each Fall, an annual pass for complimentary parking when visiting GBMC, prominent listing in the GBMC Foundation's Annual Report and invitations to GBMC events. Created in 2007, the GBMC Founder's Circle recognizes the generosity of hospital contributors who donate $500-$2,499 annually. Founder's Circle members are listed in the GBMC Foundation's Annual Report, have early access to the Nearly New sale and are included on the GBMC Founder's Circle donor plaque in the hospital. Created in 2012, the Physician's Club recognizes the generosity of physicians affiliated with GBMC who donate $1,000 or more annually. GBMC HealthCare doctors do amazing work for our patients and it is important to recognize those who go above and beyond in support of the hospital. Benefits to those physicians who donate include their name in the GBMC Foundation Annual Report, their name on a plaque in the hospital and invitations to the Physician's Club Dinner, where they will receive special recognition. Membership benefits are based on cumulative giving totals from the prior calendar year. To receive continuing recognition and benefits, your gift must be renewed annually. *Current membership card must be presented to receive benefits on campus. Choose a restricted fund report below. The mission of the Philanthropy Committee is to generate charitable funds in support of GBMC HealthCare. The Philanthropy Committee members along with the GBMC HealthCare and Gilchrist Services Board of Directors have a responsibility in carrying out this mission – with the support of Philanthropy staff – through annual appeals, fundraising events, major and planned gifts. Together, we will seek gifts from grateful patients, families and friends of the GBMC HealthCare system, as well as corporate, foundation and government grants.